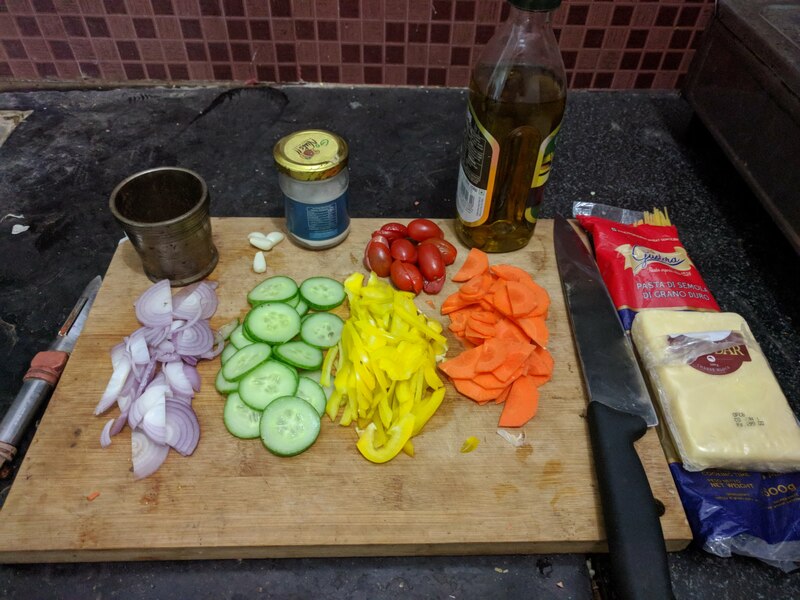 Short background: I intend to document a series of quick dishes that are conducive to the survival of a lazy guy, something that can preferably be done under twenty minutes. I call this survival cooking. In part, it will help some of my friends and in part, I would be less inclined to eat outside food if I force myself to document what I cook. Without further ado, here is one that I often gravitate towards. This recipe is called one-pan pasta because it is made in one-go in a single pan. 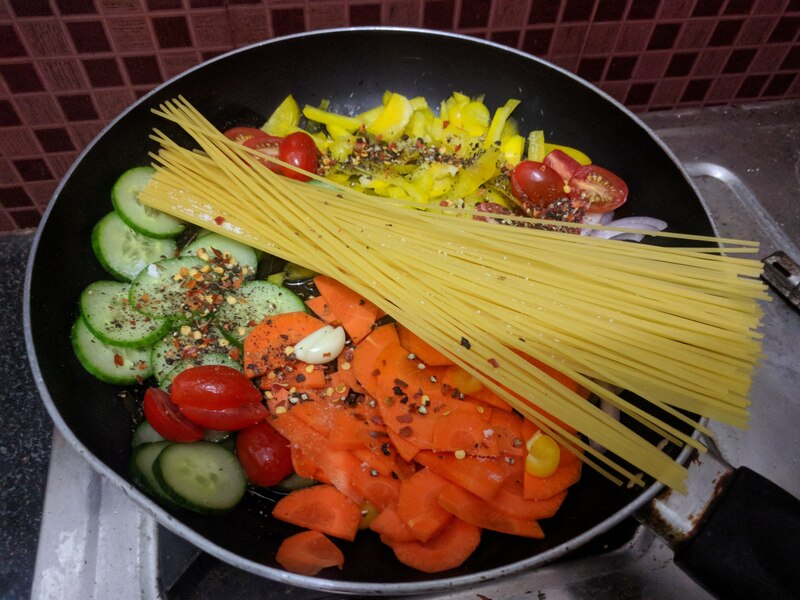 Spaghetti, cheese, 1 medium onion, 1/2 cucumber / zucchini, 1/2 bell pepper, 1/2 large carrot, few cherry tomatoes, a couple of cloves of garlic, salt, pepper (black + chilli flakes) and oil. Here are some pointers to take care of while preparing the ingredients. Firstly, slice everything thinly. 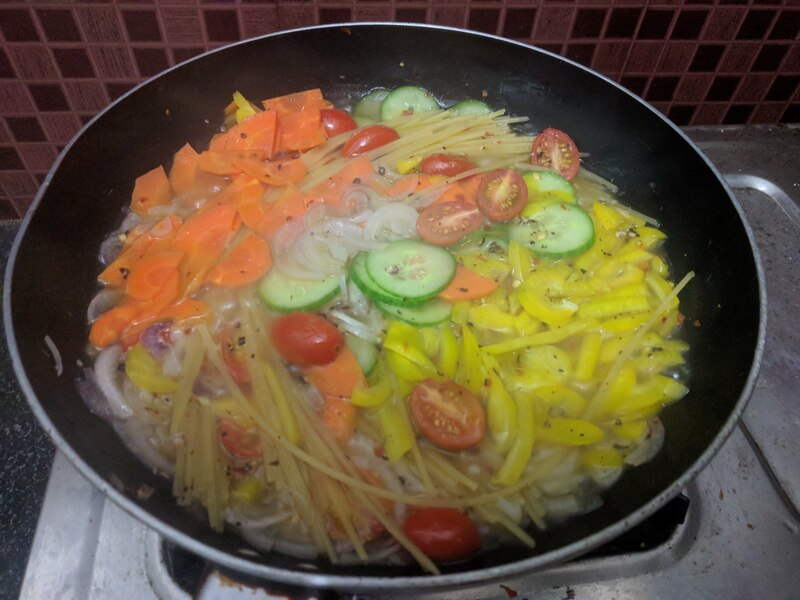 Otherwise, the vegetables will not cook by the time the pasta is done. The harder the vegetable, the thinner the pieces should be. (I like my carrots to be a bit crunchy so I kept them slightly thicker.) Secondly, use a pasta shape that cooks faster, say, spaghetti. Thirdly, try to avoid processed cheese. The taste is quite different from natural cheese. Needless to say, the choice of vegetables is upto you. Pour some oil and then arrange everything in a pan. This is before I have poured water and lit the burner. I would like to point out two things. Firstly, the above image shows a somewhat optimised pasta-to-vegetable ratio. Secondly, the spaghetti sticks I had were longer than my pan. I had to slowly push them in as they became soft in boiling water. If you don’t want to do that, just break the sticks in half. The amount of water should be just enough to cover the ingredients. This is the state of the dish midway. I had to add half a cup of water as the water had almost dried up before the pasta was cooked. You know it’s done when the pasta is firm but cooked. Chew into a strand to check if it is raw. Add water if necessary, but be cautious of the amount. It is better to add water in a controlled fashion than have a soup in the end. Before taking the dish off, add some cheese (or some olive oil if you want to ease off the cheese). 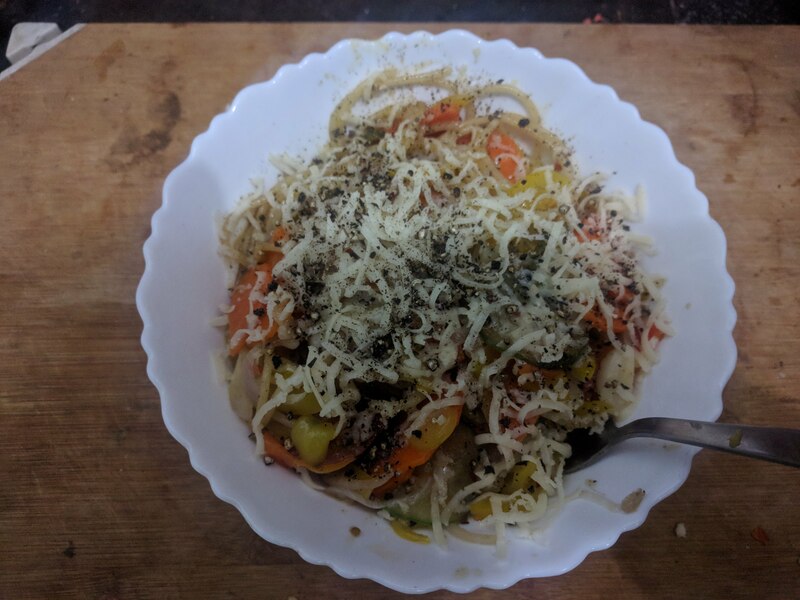 Here is the final dish with grated cheese and black pepper on top. It took me more time to write this post than to actually make the dish! There are many variations available online. I would suggest that you look around and pick up whatever tips you can in order to reduce your effort.